It’s Thanksgiving, and cranberry sauce is unavoidable. But did you know just 2 ounces of the canned stuff has 22 grams of sugar? That’s a ton of empty calories for a simple condiment! However, to NOT have cranberry sauce on Thanksgiving is like not having apple pie on Fourth of July. Add cranberries, apples, dried fruit and 1 cup of water to a large saucepan. Heat over low heat and let cook slowly, stirring occasionally – cranberries should pop. In a blender, puree the oranges, then add to the mixture. Continue to cook on low for 10 minutes. If mixture gets TOO thick, add more water, a little at a time. 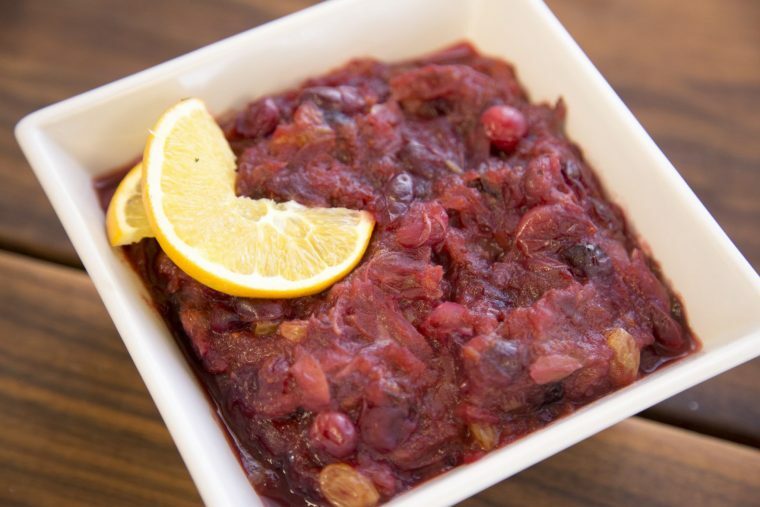 Taste for sweetness – if not sweet enough, add a little more dried fruit to the mix – raisins, cranberries, dates, cherries, and figs all work beautifully. Let cook until fruit is softened. Remove from heat, stir in vanilla extract, and let cool before serving.